I teamed up with some of my amazing friends online so we could offer an awesome giveaway in December. Since it’s the Holiday Season, we’re making the prize even bigger than normal. It’s a $1000 Amazon Gift Card! This giveaway starts today, and runs through December 20, 2013. 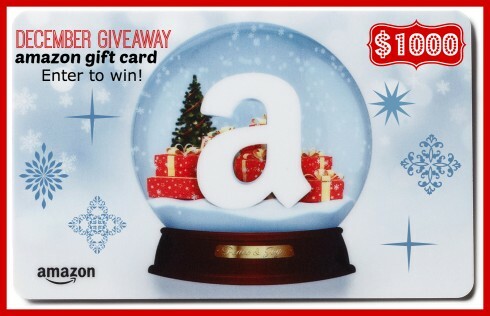 Seriously, who wouldn’t want a $1000 Amazon Gift Card during the holiday season (or at any time for that matter!)!? There’s no gimmick, just 10 friends getting together to offer you a chance to win something really awesome. We’re sponsoring this giveaway ourselves. 1. Click HERE and browse Amazon to decide what you’ll buy if you win! 3. Leave a comment below telling us what you’ll buy if you win. 4. Use the Rafflecopter below to confirm these entries and unlock more! A blendtec or vitamix blender!! I would be able to buy books to my heart’s content, and a Vitamix! I would love to upgrade my food processor, get a newer vacuum cleaner, and otherwise purchase school books for my son…and I am sure my nieces and nephews could use things from there as well. I’m a kitchen nut and need to renew some of my small appliances, new pots and pans, anything for the kitchen. I’d get the BOSCH Kitchen Machine! I’m drooling just thinking about it! Then pick up some nice gifts for my husband (probably hunting type stuff) and kiddo’s. And some great new school books for the kids too! i would buy a lifetime supply of coconut oil and gelatin! I would buy Christmas presents for my family. Because I don’t have a job, so no money to buy them things. so my hubby and I lost our house (and the majority of our possessions) in the tornado that hit Moore, OK on May 20th… so we will be needing to replace loooots of stuff when we get into a house next year. (I know, not a very Christmasy answer) so Amazon is going to be our new BFF! we would use this gift card to replace our kitchen supplies. I’m trying not to think about how much replenishing all our kitchen stuff will be. Denial is totally working for us right now. I’d stock up on some of my favorite healthy foods, buy a new desk, some awesome luggage, a new bag… Basically my whole Amazon wish list! Lots of coconut milk, almond flour, coconut flour, nut butters, etc. There is never enough to feed my very large sons! 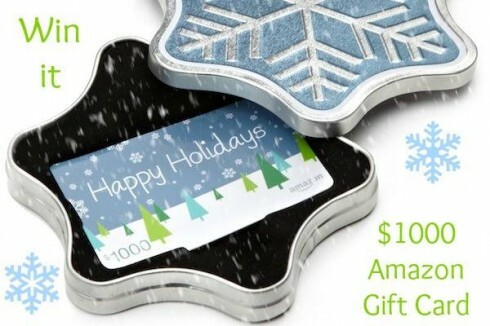 What a wonderful gift to receive $1000 gift card from amazon. First thing I would get is the pull out under cabinet holder for my ipad. I am constantly using my ipad for recipes. That would be a great gift. Love the food processor. Never had one and there has been times where I wish I did. The chair massage would be great after a long day of taking care of the family and cooking great recipes. Thank you for this opportunity ! FCLO and gifts for the kiddos! I want to buy a swing set for my kiddo Jack and maybe a few happies for myself too! I would go straight down my wish list for all the things that never are a priority at the time. Gifts for my daughter and granddaughter-to-be. I would by a wine refrigerator for my husband or maybe a keg with tap for our kitchen! I would stock up on Great Lakes Gelatin and buy a juicer. Build a new computer yeah! There are so many new books coming out from all my favorite lchf gf bloggers- that’s where I’d start with my $1000 Amazon gift card! Then on to new kitchen tools! I would love to use it for books, a dehydrator and maybe a juicer! Thank you for this giveaway! Previous post: Dye Your Hair …with Coffee! Next post: 9 Things Essential to Surviving Your First Trimester!